Add graphs to the OpsCenter Monitoring Dashboard to monitor latency between datacenters and nodes. Messaging latency metrics are available for DSE versions 5.1.0 and later. 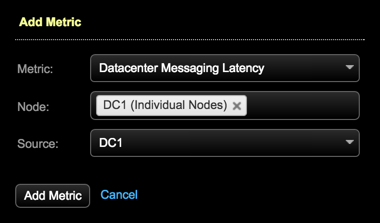 Choose Datacenter Messaging Latency from the Metric list. 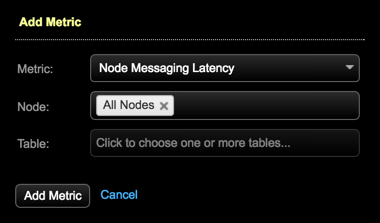 Note: If multiple selections are made in the Node list, reported latencies are aggregated for all selections. Select the datacenter from the Source list. Repeat the procedure for the Node Message Latency metric. Selecting a source datacenter is not applicable to node-level graphs. Add as many variations of these metrics as required for your environment. When finished, click Save Graph. The graphs appear in the dashboard.